Kimya e Saadat Alchemy of Eternal Bliss actually in Persian language and written by Imam Ghazali r.a. This is the revised English version of this great book which is translated in to English by Muhammad Asim Bilal with great care and skill. He has full command on both the languages. Revised by Justice Dr. Munir Ahmad Mughal. Imam Ghazali was a Persian theologian, philosopher, and prolific Sunni Muslim scholar. He has a distinguished place in the Islamic history. He was first-rate genius who popularized moral knowledge among the Muslims. According to some well known thinkers and historians of modern world, Ghazali’s greatest achievement consisted in dethroning philosophy from the highest pedestal of knowledge and enthroning spiritualism in its place. 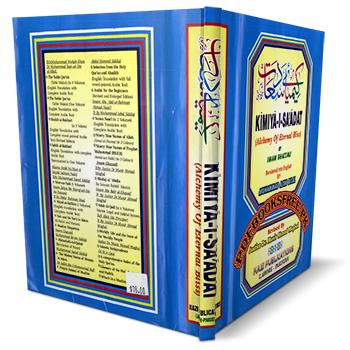 The English version of Imam Ghazali’s book “Kimya e Sadat” is now available here on Pakistan virtual library in high quality Pdf document with the facility of online reading and download. Check out the following links to read online or download the complete book in Pdf format and enjoy offline reading.